The leader of the Indigenous People of Biafra, Nnamdi Kanu, has said that the offences for which he is being tried, do not compare to the 1983 coup d’état which led to the enthronement of Muhammadu Buhari as military head of state. Mr. Kanu, who spoke through his lawyer in court on Thursday, said the case of treason against him should be immediately dropped. “He’s a freedom fighter unlike people who overthrew a legitimate government in 1983. The court has no option but to discharge the charges. The court should trash the charges,” said his lawyer, Ifeanyi Ejiofor, as he addressed the federal court in Abuja. As a military general, Mr. Buhari, Nigeria’s current president, led a coup d’état that removed the Shehu Shagari government in 1983. Mr. Buhari was later deposed by another army general, Ibrahim Babangida in 1985. Mr. Ejiofor repeated his point that Mr. Buhari’s comments suggested that the presidency had taken a position on the matter, hence the likelihood that his client will not be treated justly. Mr. Ejiofor said the evidence before the court do not in any way indict his client of treason and prayed the court to quash the case. He also asked the court to enforce an earlier ruling by Justice Ademola in December 2015, in which the defendant was granted an unconditional freedom. “The Biafra agitation predates this present administration. The fact that the Honourable Justice Ademola decided that there was no incriminating evidence against the first defendant, he ordered his release but this was blatantly refused,” Mr. Ejiofor said. He accused the prosecution of playing to the gallery, stressing that the ongoing trial had already been determined by certain persons in high places. “There is no ingredient of treasonable felony found in the proof of evidence before your lordship,” said Mr. Ejiofor. 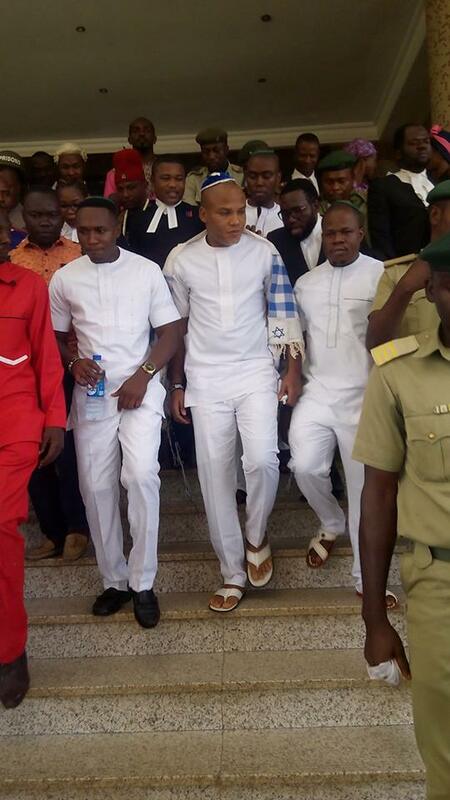 Mr. Kanu’s trial had on December 13 been suspended abruptly following a rowdy session created by the defendants. The trial continued on Tuesday. Mr. Kanu, and three others, David Nwawuisi, Benjamin Madubugwu and Chidiebere Onwudiwe, are facing trial for alleged treasonable felony. WHY WE CELEBRATE THIS SOLEMN AND TEMPORARY VICTORY LET ME REMIND US THAT THE BATTLE IS FAR FROM OVER.THE QUESTION IS HOW WELL ARE WE PREPARED TO RESPOND SHOULD OUR LEADER NNAMDI KANU AND OTHERS,ARE ASSASSINATED?GOD FORBID IT HAPPENS AND GOD FORBIDS THAT AM A PROPHET OF DOOM.BUT LETS FACE THE FACT THIS IS THE ONLY GAME LEFT TO PLAY BY THE CORRUPT AND DESPERATE GOVERNMENT OF NIGERIA.MY OPINION IS THAT NNAMDI KANU AND CO SHOULD NOT SACRIFICE IN-VAIN. The Lord will surely do it. God forbid nothing will happen to them.our ohamadike 1 of igboland.....will be alive.